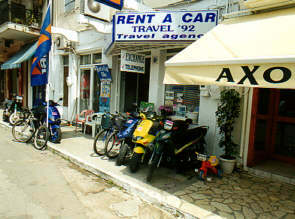 Nidri is a town on Lefkas with a lot of tourists. 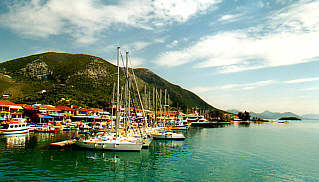 In the holiday season, the marina of Nidri is filled with lots of sailing vessels. Along the boulevard, as well as in the main street, there is a wide choice in restaurants. That is... there is a wide choice in Greek restaurants. You won't find Chinese or Indian Tandoori here. 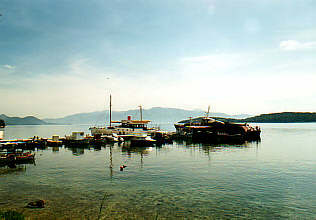 Near Lefkas are lots of small islands. 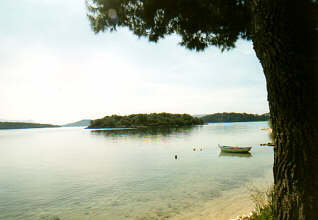 One of them is Skorpios, the private island of Onassis. You are not allowed to visit Skorpios, but there are lots of cruises that go near it. Amazing how popular it is to look at an island similar to any of the others, just because someone with a lot of money doesn't allow you to come there. 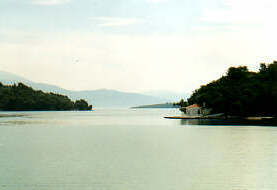 Nidri is a popular place, not only for tourists, but also for school outings for children of 12 and 13 years of age. There is a large parking place for buses and trucks just outside town, don't be surprised if you see 20 or more buses here. And even if you know each bus brought about 50 children here, you'll be surprised of the hordes of children you encounter. We discovered Greek children look very much the same. There are only four types: boys and girls, fat and slim. On the picture on the right you can see Nidri doesn't forget children younger than 12: at the car rental agency they can rent a tricycle. Our hotel was a few hundred meters north of Nidri, in a 'village' called Perigiali. 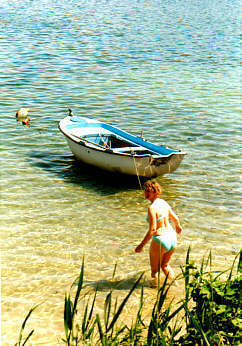 On the waterfront, this was a very quiet place, where we had our own beach, which was also a great place to look at he harbor of Perigiali and the little islands.